Now you can take it with you! 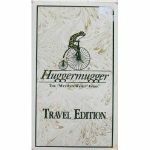 Huggermugger Travel Edition packs all of the exciting fun of the original game in a handy take-along size. Everyone has a favorite game, and in the Huggermugger Travel Edition, you'll play them all! Whether you like to unscramble mixed-up words, think fast in rhyming, reasoning and remembering, or simply spelll, it's all here!